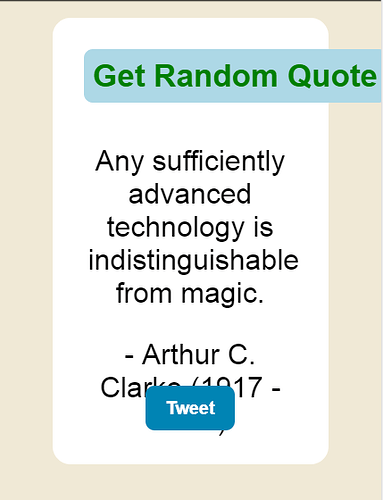 My Quote Machine - Your Thoughts? I was hoping I could get some feedback about the project. Does the code seem to be reasonably well written? Do you have any other thoughts about it? I would really appreciate any feedback I can get about it. Finally, why not have a quote load when the page first loads? Thanks for the insights. You’ve made very good points and I really appreciate it a lot. I will make sure to make the appropriate changes. I think this will be a good opportunity for me to practice CSS media queries. Your buttons don’t look very buttoney. Consider using the CSS pseudo-classes :hover and :active to implement some of these effects.